The landscape of the area is complex and abrupt because of the erosive action of the glacier accumulation process, which doesn't exist nowadays. 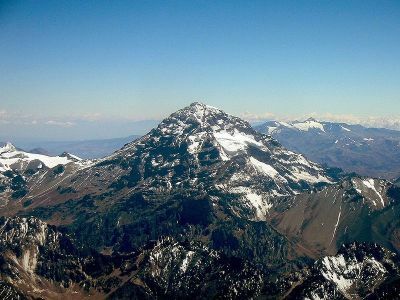 After much geomorphologic process, the Cordillera de los Andes raised as a group of mountain chains that surrounded a deep forest valleys crossed by rivers and lakes. In the coast sector there are Lapataia and Ensenada Bays, where precipices and little beaches are intercalated and constituted an ideal ambient for a seaside “avifauna”. Between the flora that characterized the “Andino-Patagonico” forests, the “lenga” is the better distributed, forming large extensions of pure forests that covers the mountain slopes from the level of the sea to 600 metres. 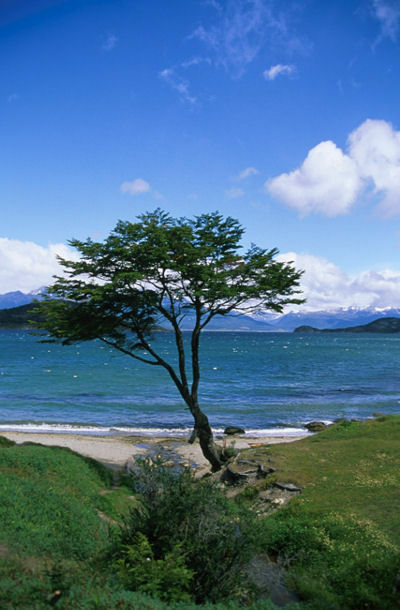 The “guindo” or “coihue de Magallanes” coexists with the “lenga” in the wettest areas, like in Pipo River Valley and in some mountain slopes in the south side. Over their branches lives the “farolito chino”, a “hemiparasita”, and the “pande indio” or “llao llao”, a parasite fungus. 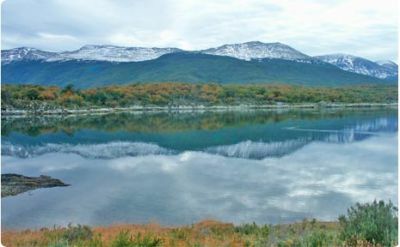 The pure “guindo” forests develop in the rainiest areas, like Beagle channel coast. There also grows other species from the wet forest like the 2canelo” and the “leña dura”. In many places the “canelo” is abundant and forms little forests. In the windiest regions the “guindo” acquires a particular shape, known as “arbol bandera”. The prickly bushes like “calafate”, “chaura” and “michay” –which has orangey flowers- grows in the “sotobosque”. In the wettest grounds grows “frutilla del diablo” and little ferns. During the summer plants with beautiful flowers like "orquideas amarillas" and "luzuriagas" cover the “sotobosque” ground. Is common to see in marginal areas of the forests “mata negra” brushes accompanied by “calafate”, “parrilla” and “notro”. This last specie, with red tubular flowers typical of the spring of Tierra del Fuego, can be found also in the Beagle Channel coast and in the west side of Lapataia Bay. On top of 600 metres over the sea level develops the “altoandina” vegetation composed by little bushes, plants “en cojin” and “gramineas”. They develop over rocky grounds that alternated with “vegas” or “malines de altura”. The vegetation of this ambient is adapted because of the wind exposition, the water disponibility and physics characteristics of the ground. The “turbales” or “turberas” are typical of Tierra del Fuego landscape. Rests of vegetables compressed by the relief depressions compose the “turba”. The “turba” growth is only possible in wet areas, where low temperatures are registered and avoids organic matter decomposition. Low pressure in a less oxygen and acid ambient produced the slowly died plants accumulation that produced the “turba”. 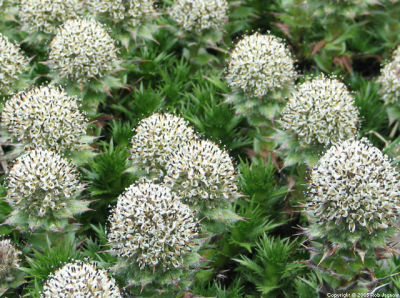 One of the typical herbs that grows in the marine area of the Park is the “siempreviva”, and also grows there little bushes like “chaura” and “mutilla”, and “liquenes” and “musgos” covers the rocks next to the sea. In the maritime littoral “cachiyuyo” forests, big seaweed, stands out. In the area live a little wild animals variety, composed by twenty mammals specimens and ninety types of birds. But there isn't any amphibian. One of the mammals that can be easily seen is the “zorro colorado fueguino”. The “guanaco” is an herbivorous that lives in the high zones almost the whole year and only goes down to low valleys during the winter. 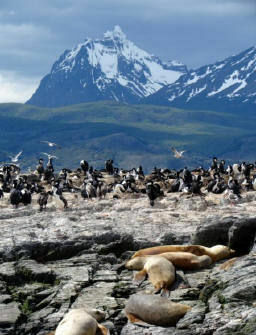 Other specimens like the “murcielago orejas de raton”, “raton colilargo”, “rata conejo” and “raton lanoso”, and “huillin” (a carnivorous aquatic mammal from the otter family that lives in the Beagle Channel coasts and in Lapataia Bay) are also present in the area. The flashiest and most present birds in the visited areas are three types of “cauquenes”. They are “cauquen comun”, “cauquen real” and “caranca”, which lives in opened places and beaches. In some occasions they are accompanied by noisy “bandurrias”. Other typical birds are “carpintero patagónico”, “maca común”, "maca grande”, “garza bruja”, "pato creston”, “pato overo”, "pato maicero”, “aguila mora”, "carancho austral”, “chimango” and "tero común”. Usually condors can be seen over flying the peaks and “fueguinos” valleys. In the marine coast, during the low tide, “diente de perro”, “mejillones”, and red and green seaweed can be seen. 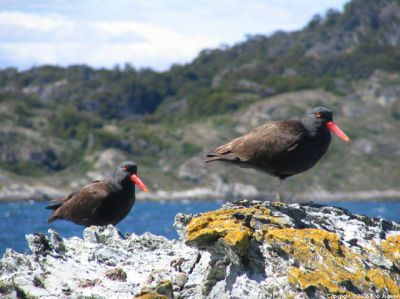 In Lapataia Bay and in the estuary that forms the Cormoranes Archipelago are many molluscs like “mejillones” and “lapas”. Also abounds other molluscs like the “vieira”, the “caracol de luna”, “caracol con diente”, some crustaceans like “centolla” and native fishes, like “sardina fueguina”, “merluza de cola” and “robalo”. During the summer, in crystal clear jellyfish concentrations can be seen. 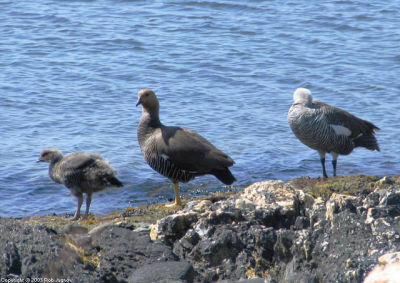 Also is possible to observe different birds like “gaviotas”, “patos vapor”, “ostreros” and “cormoranes”. In the region there are many animal species that were introduced by the man, many decades ago, with economic purpose. Like the “conejo europeo”, “castor”, “rata almizclera” and “zorro gris”. These animals became wild in an environment that is not prepared to support. So that many of them caused serious impacts in the natural landscape. For example, there are many affected areas by castor's colonies because they cut trees to construct their dikes, causing floods in many sector of the forests and many tree's death. Today, there have been 23 visitors (82 hits) on this page!